The United Nations Sustainable Development Goals (SDGs) tackle poverty, climate change and fighting inequalities. The 17 goals encompass an agenda to achieve each Goal and target by 2030. 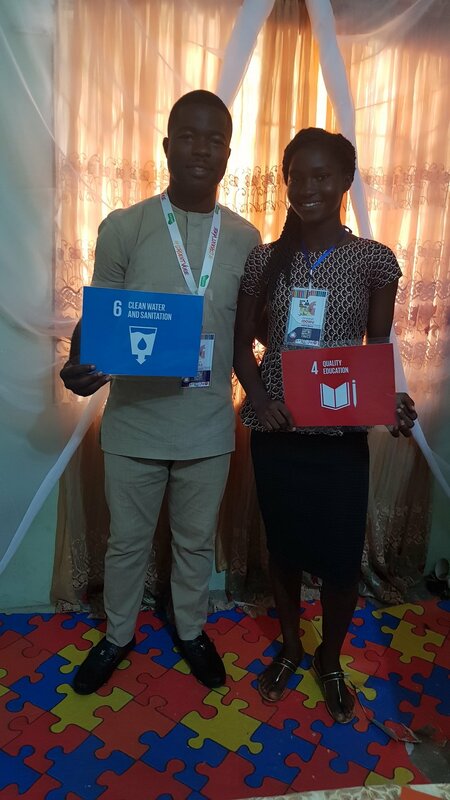 The SDGs are built on the idea of partnership, therefore Jacob Sule from IRead to Live in Nigeria and Laura Fleming from Worlds of Making in the United States, amongst a team of thought leaders and advisors, are teaming up to ensure that young people in Nigeria get involved in creating solutions to societal problems. The SDG targets are interconnected and aim to leave no one behind, however one of the biggest challenge the Nigerian youth faces amongst other things is having access to resources that will help to enable them take actions and realisation of the of the Goals. Schools are poorly funded, poor curriculum, under staffed, shortage of skilled and qualified teachers, lack of basic educational facilities, absence of proper sanitation facility and perimeter fencing to keep the schools safe and secure. To create United Nations Sustainable Development Goals (SDGs) driven educational makerspaces, through an “Adopt a School Initiative”, in the Osogbo, Osun State Nigeria for young people, where they will be working towards the 17 targets outlined in the SDGs by creating local solutions to addressing the immediate needs of their environment. To adopt four schools, initially, within the Osogbo, Osun State Nigeria community, deploy resources, teaching aids, writing materials, train teachers, and appoint coordinators to lead the students in taking actions to create sustainable solutions to societal challenges. All schools in the Osogbo, Osun State community will be contacted about this project and if they have an interest, be required to submit necessary documentation to support the work and show commitment to the success of the project. If there is interest from more than four schools, they will be waitlisted for future iterations of this project. Promoting secondary school students / youth involvement in achieving the SDGs is critical to achieving them. We are striving to build internal capacity in Nigeria in supporting their youths in solving problems in their nation that they care about, and that will create sustainable impacts. Effective monitoring and review processes are key to achieving our Targets. The target will be measured by the members of teachers, students and community representatives involved and include the numbers of community projects done, the numbers of problems addressed in various schools, and the solutions created by the students and their relevance to their communities. The project will be coordinated and governed by 4 iRead Volunteers who will be deployed as resource persons to coordinate the implementation. They will be trained and equipped with necessary information about the SDGs. Volunteers will be provided with a car that will be filled with supplies and delivered to participating schools. They will use the car to travel from school to school to train students and teachers on the SDGs and to provide an overview of the project, along with closely monitoring the efforts of the schools, on a weekly basis. Teachers and Student leaders will also be appointed and commissioned as Team Lead for each of the SDG Targets. Two representatives from the community will also be enlisted alongside the Coordinating Team. This support will help to ensure that the project will focus on substantive issues related to building partnerships and capacity, conducting advocacy, and ensuring the implementation of action plans. Information will be managed and shared through a designated website. Where Internet is not available, briefing packs can be regularly distributed to coordination members. A central Whatsapp group will also be created to track and monitor progress and situational reports. We have created an Action Plan to serve as a guiding framework that outlines our project efforts and associated activities, allocates specific roles and responsibilities to various stakeholders, and identifies indicators for measuring whether objectives have been met. It will increase accountability and is critical to both coordination and programming, as well as facilitate advocacy and communication. Action-planning is a cyclical process in so far as any Action Plan requires regular monitoring and revision, helping to promote continuity and sustainability. Please contact us directly for more information on that plan.